These have the same appeal as the Unfortunate Events series, with their multi-threaded mysteries, and droll word-based humor. I don't know at what age Felix and Trudy might like them, but I read them for fun. This picks up exactly where the last one left off, with a slightly expanded mystery but firmly locked within the larger story in Stain'd-by-the-Sea. I can probably review these as one big item. But I didn't! The three of us stood there for a minute. I don’t know what Stew was thinking, and the filing cabinet wasn’t thinking anything. But I was thinking, is this the world? 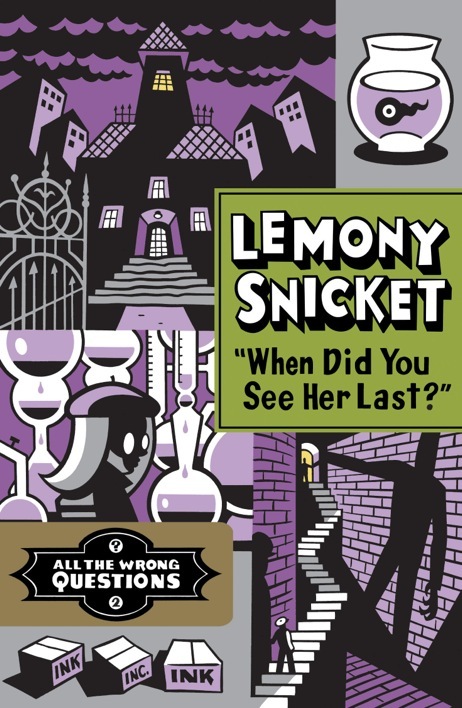 Is this really the place in which you’ve ended up, Snicket? It was a question that struck me, as it might strike you, when something ridiculous was going on, or something sad. I wondered if this was really where I should be, or if there was another world someplace, less ridiculous and less sad. But I never knew the answer to the question. Perhaps I had been in another world before I was born, and did not remember it, or perhaps I would see another world when I died, which I was in no hurry to do. In the meantime, I was stuck in the police station, doing something so ridiculous it felt sad, and feeling so sad it was ridiculous. The world of the police station, the world of Stain’d-by-the-Sea and all of the wrong questions I was asking, was the only world I could see. Nobody likes to be tapped on the knee. Practically nobody likes to be tapped anywhere. Asinine is a word that sounds like you shouldn't say it, so when you do say it, people often gasp. This makes it a delicious way of saying 'not very smart,' which is all it means. It seemed to me that every adult did something terrible sooner or later. And every child, I thought, sooner or later becomes an adult. Nobody wants to hear that you will try your best. It is the wrong thing to say. It is like saying 'I probably won't hit you with a shovel.' Suddenly everyone is afraid you will do the opposite. Do the scary thing first, and get scared later.